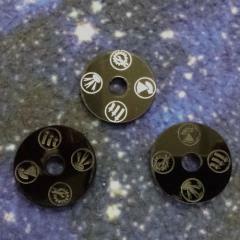 These dials are great replacements for the command dial inserts in Star Wars - Armada by Fantasy Flight Games. This set has dials that drop in place of the cardboard command dials. The should last much longer and can be customized with paint or crayons to fill in the etching!